How many times does this happen to you- you remove a perfect baked cake from the oven but once you flipped it out to a plate, it stuck. Frustrating right? If you ever have this same situation, you’re lucky because I have the right fix on how to get cake out of bundt pan. I love to bake cakes and lately, I’ve been into bundt cakes because they need no complex embellishments. However, they often stick especially if you forget to grease the pan or the nonstick coating has already lost its effectiveness. To learn how to remove the cake out of a bundt pan in one piece, keep reading below. You need a plate to serve as the container for your baked cake. The size should be larger than the actual size of the pan so your whole cake can be contained properly. 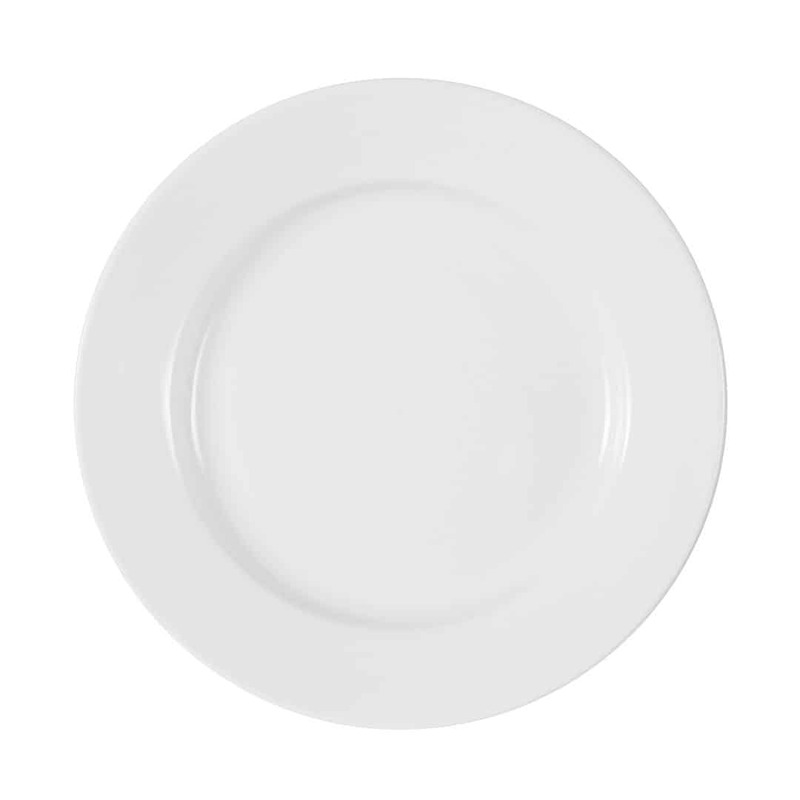 Since you’ll be using the plate as a serving container, make sure that it looks presentable. What I like to use is a cake ﻿﻿﻿plate ﻿﻿﻿with a dome because it looks exquisite plus the lid cover can help keep the cake fresh longer. 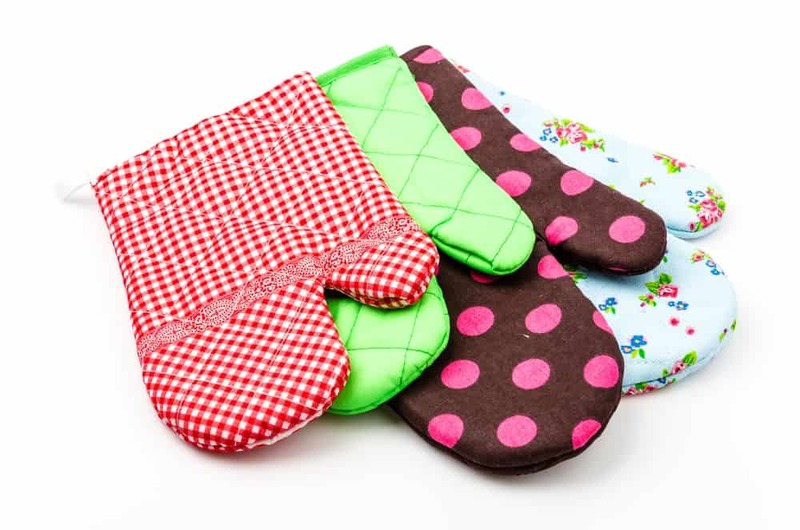 To protect your hands from burns, use a good pair of oven mitts. You’ll need it when holding your hot pan. Make sure the mitts fit well on your hands so you can grasp on things easily. The best material that you choose is silicone because it tends to provide a water-resistant feature, making it ideal when carrying a hot pot of liquid. 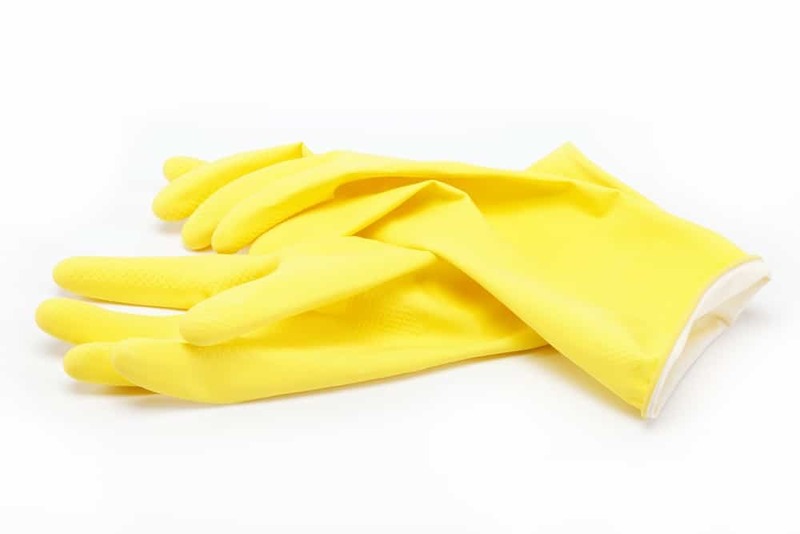 A good pair of rubber gloves comes in handy when soaking your bath towel with hot water. You’ll be snuggling the hot towel around the pan, so the rubber gloves serve as hand protection from unnecessary burns. A heat resistant and waterproof gloves are more preferable, just like this one. 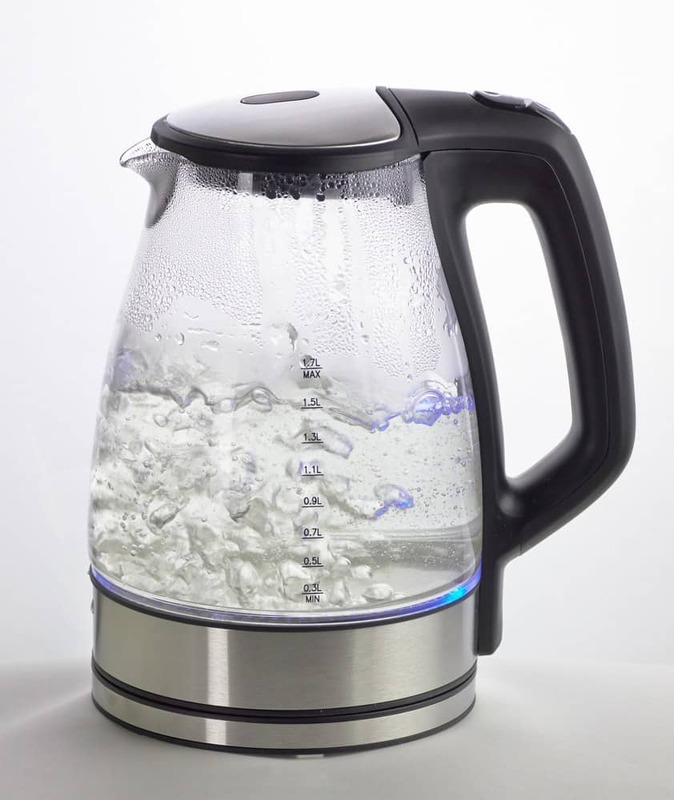 You need a teakettle to boil water for your steaming process. The steam will aid in releasing the cake easily. If you have teakettle at home, use it, but if you don’t you can use a deep saucepan or pot to boil water. 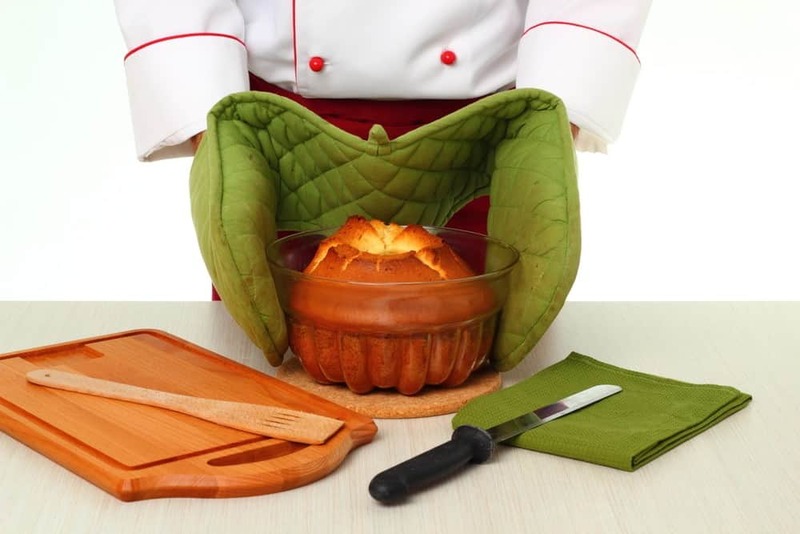 The bath towels will be needed when you try to create steam for getting the cake out from the bundt pan. Use any bath towel available in your kitchen. You need one to soak in your sink and another one to place over the pan to hold the steam well. You need water to boil on your teakettle. 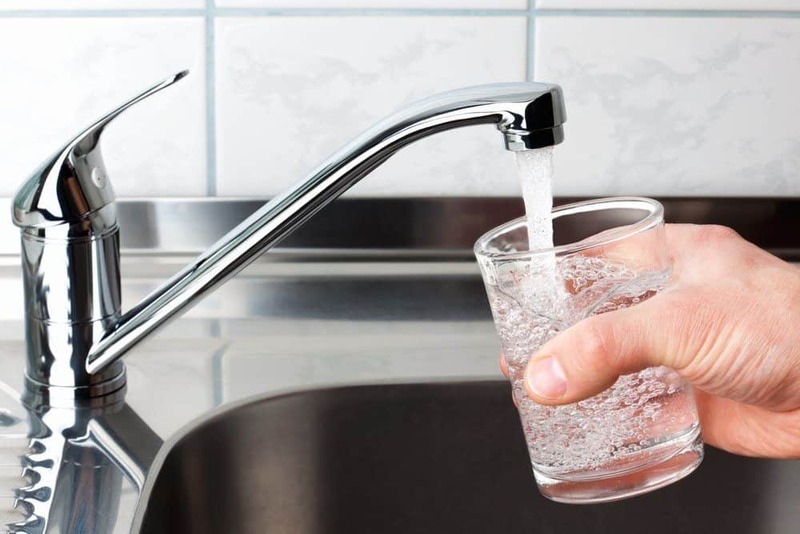 There’s no need to use filtered water because you’ll only use the hot water to soak one piece of the bath towel in the sink. Make sure that you fill your teakettle with water because you’ll be needing a lot of hot water to soak the whole bath towel, maybe a liter of water will do. 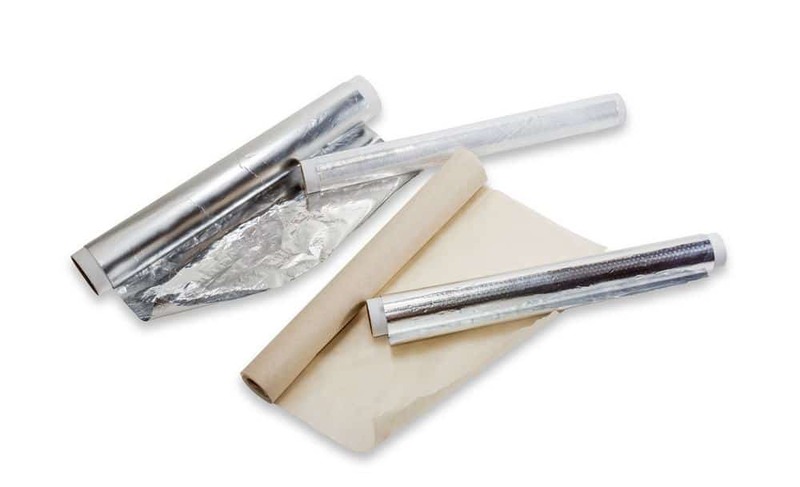 To protect your cake from the infiltration of any water, seal the pan with aluminum foil. For better strength, use heavy-duty which can endure extreme heat. What I use is the Reynolds Wrap Heavy Duty Aluminum Foil. A wooden spoon may be useful at the time when you remove the cake from the bundt pan. A solid tap from the wooden spoon can help loosen the cake around the sides. Make sure to do it gently so you won’t be doing more harm than good. 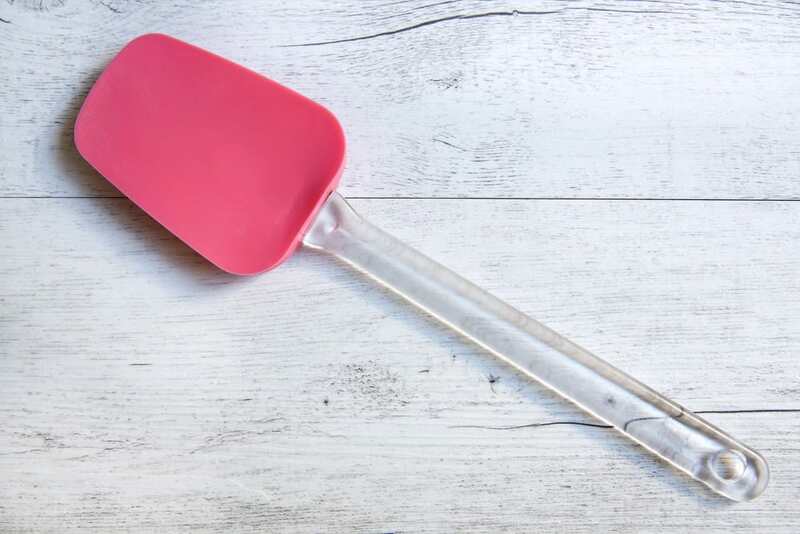 Using a rubber spatula is optional because you’ll only need it if the steam is not effective in removing the cake from the bundt pan. You can use it to run around the edges. If you’re skilled in using a knife, then you can use it instead of a rubber spatula to loosen the cake on the sides. Be gentle when using it because you don’t want to cut into the cake. A grapefruit knife is a good knife to use because of its small size and a slim blade. Boil some water on your teakettle. 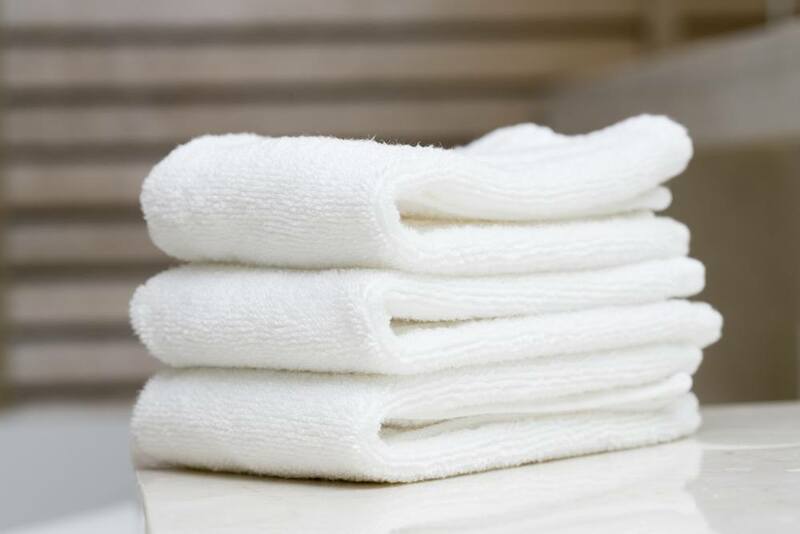 While waiting for the water to boil, place the bath towel in your sink. Once the water boils, pour the hot water over the towel until it’s fully soaked. Before you place your pan on the hot towel, shape it in a way that it looks like a nest. Don’t forget to wear your rubber gloves or you’ll end up with some nasty burns. To prevent water from mixing into your cake, cover it with aluminum foil. 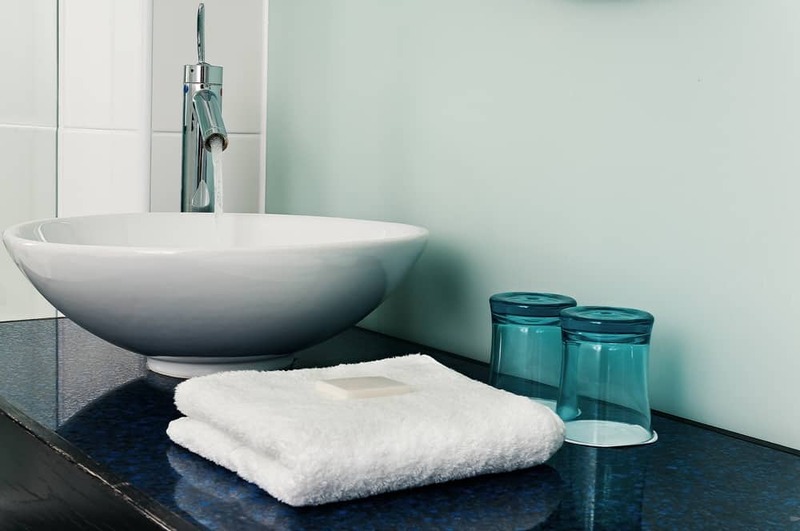 Next, you can rest your sealed pan above the wet towel. To secure the pan properly, snug it well by pushing the towel around the pan’s sides. Remember to face up the open end of the pan. To hold the steam effectively, cover the pan in the sink with another bath towel. Keep it covered for about 15 minutes. During this period, the moisture from the towel will make steam and the steam will help loosen the cake when you flipped it. After 15 minutes has elapsed, uncover the pan, remove it from the sink, and dry its exterior surface. Don’t forget to wear your oven mitts to protect your hands from burns. To loosen the cake, hit the pan’s bottom against a solid surface, like your countertop. 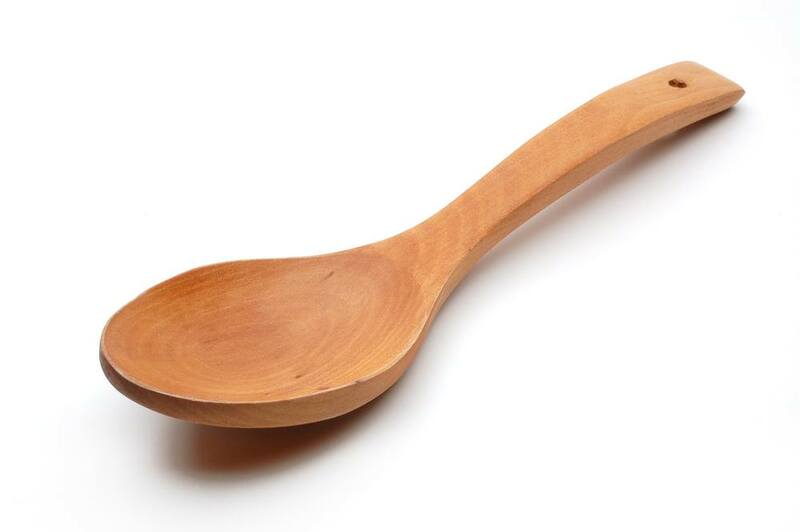 You can also tap the sides with a wooden spoon. 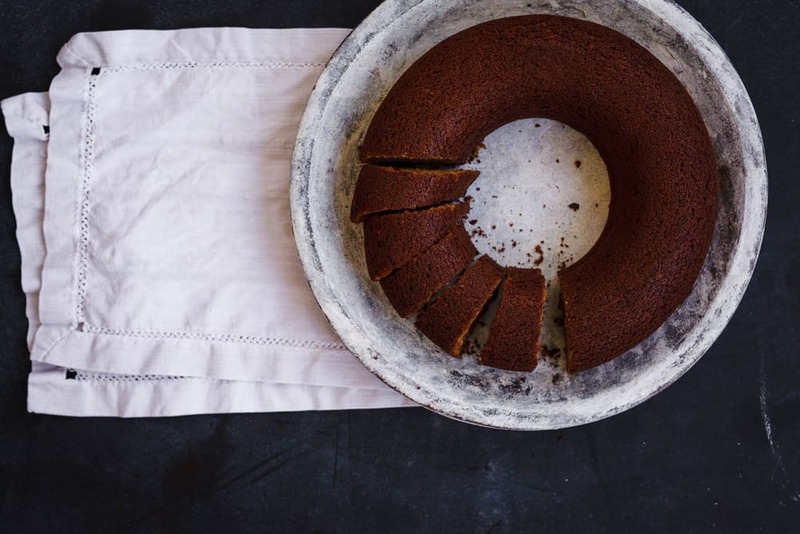 Make sure that you do all these things gently so you can still have the integrity of the cake intact.With the open end of your bundt pan facing up, place your cake plate upside down. Grab the plate and the pan together then give it a good flip. Watch how to remove the cake from the pan properly in this video here. If the cake is released perfectly, then you can stop here. However, if the cake is still stubbornly inside your pan, proceed to the next step. With a rubber spatula, run it along the edges of the bundt cake. A grapefruit knife can also do the job of loosening the cake around the sides. 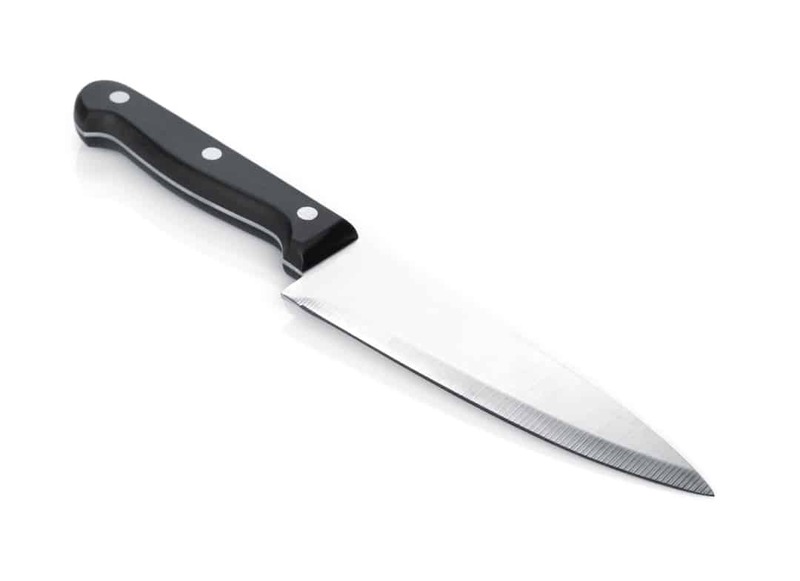 As compared to a straight edged knife, a grapefruit knife is slightly curved which offers more flexibility. As you run the grapefruit knife around the cake. Be gentle not to cut through the cake. Place the plate in the pan and flip it upside down. You should have the cake come out from the pan already. Watch how you can run the knife around the cake in this video here. Bakerstreet suggests preparing your bundt pan before baking. All you need is a greasing ingredient and flour. There are a lot of greasing ingredients that you can select, such as butter, vegetable shortening, or baking spray. To apply the butter, use a paper towel to spread it all throughout the nooks and crannies inside the pan. For baking spray, use a pastry brush to spread out what you spray, just like in this video here. After you have greased the pan, apply a generous amount of flour and dump out all the excess. For more convenience, you can use a baking spray with flour, like this one. The dean of baking and pastry at the Culinary Institute of America, Thomas Vaccaro, recommends freezing the cake before removing from the pan. A cold cake has a less chance of falling apart. Before you put it in the freezer for about six hours, let it cool at room temperature for about an hour. Once the cake is frozen, get a butter knife and run it around the pan’s sides to loosen the cake. Place a plate on top of the pan and flip it over to release it quickly. For simple cakes without any mix-ins, Baking Bites suggests taking the cake out from the pan once it cools completely. A cooled cake has a less chance to break apart when you try to loosen it. If your cake includes some mix-ins, like nuts, fruits or chocolate chunks, you may want to remove it after 20 minutes of resting time. You don’t want the mix-ins to be cold because they tend to stick to the pan than those still warm from the oven. Did you have fun going through the steps on how to get cake out of bundt pan? All you need is to steam the pan with a hot towel, hit the bottom of the pan, and tap the sides. If the cake still sticks to the pan, loosen it by running a grapefruit knife around the sides of the pan. 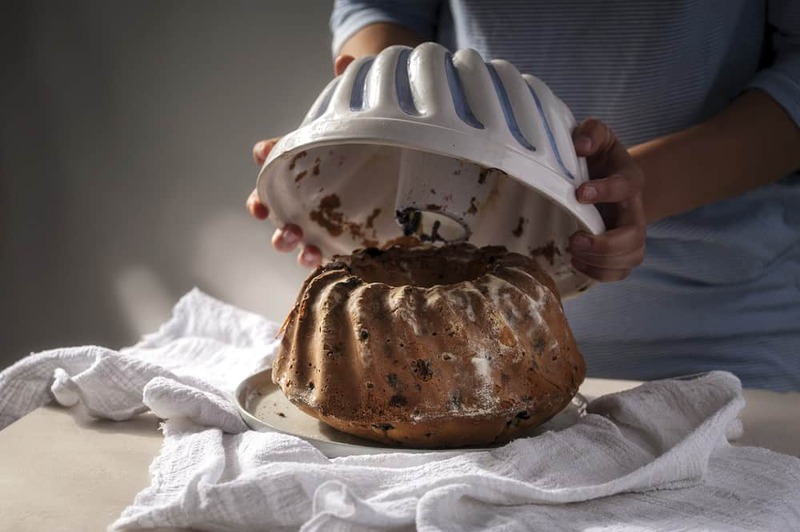 If you have tried removing the cake from a bundt pan already, let us know how you did it in the comments section below. Don’t forget to share this article if you like it.